There are so many reasons so many trucking professionals are members of #TeamRoehl. We've spent time asking our teammates to tell us about their experiences with Roehl, and we've collected some of them in the links below. We're also now collecting reviews that we can use on our site. Simply share your opinion and we might feature it on this site. Finally, you could also check out review websites like Roehl on Indeed.com and Glassdoor.com. In fact, Roehl has one of the highest ratings among all US trucking companies (and certainly for our size carrier), so if you're searching for Roehl Glassdoor rating, you should be able to find many additional reviews. Our reputation as one of nation’s safest trucking companies is earned through the experience and performance of TeamRoehl members. A note about the Roehl reviews and ratings on this page. We publish reviews without editing. We're proud of our team, and we value the experiences and opinions of our teammates. We believe that people sharing their feedback helps others learn about Roehl. Because of our values, we reserve to the right to edit or not publish a review that disparges a teammate by name. To ensure the integrity of the review process, we require all reviews to have contact information (that includes positive reviews). Another reason we require contact information is that we desire to follow up with negative reviews, if we get them. If you have any questions about this process, please contact Lucas Heart using marketing@roehl.net. A wonderful company to work for, completely dedicated to the safety, care, and well-being of their drivers. I have been a truck driver, since 2010...when I merged my willing efforts with my dad's numerous years of experience (as an OTR team). It wasn't til I encountered Roehl that I could honestly say that I have true peace of mind (regarding safety/security)...due to this company's thoroughly trained staff & well maintained premium equipment. At last, I feel like a true truck driver should...proud to serve the company I'm employed by! Perfect Company to start your driving career with! helpful and assisting throughout your experience-no matter the dept! 1st of all before I found Roehl. My job that I had before Roehl didn't care about their drivers because they wouldn't take care of their equipment. So I started looking around at other trucking companies. I noticed that there were alot of Roehl trucks driving everywhere I went. So one day I talked to one of tjeir drivers. They told me that they were driver oriented and safety oriented. So I co tacted my husband and asked him to go on some different sites and look at some comments other drivers had to say abot Roehl. He came back and told me that he didn't see and negative comments about them. So I decided to pur in an application to Roehl. They got back in touch with me with rhe week. They had me get everyrhing done before I even got to orientation. When I git to orientation the employees rhete were so friendly and professional. I was in orientation for 4 days and during orientation we went throught their safety rules and the Roehl way. After all rhat I realized that yes they are all about their drivers. When I got my truck I got a 2019 with only 43000 miles on it. But I found out they o ly kedp their trucks until they reach 400000 miles then they get new trucks. They treach me like one of their family not a number. This is the BEST company that I ever have worked for. Poor communication, always want you to do things during your home time, planners and payroll can’t do their jobs correctly. Been told nothing but lies, and they treat the new drivers like s***. This is the first company I've worked for that told the truth from day one. Orientation was the best orientation I've ever been to, the instructor was great. He made sure everyone understood how to work the truck pc, he answered all questions asked. Everything I have seen so far is straight up and can tell this is a great company to work for. Orientation was great! My husband has been with Roehl as a flatbed driver, recently he has accepted that an old shoulder injury and age have made it very hard to drive a flatbed. He requested to be moved to curtainside, along with that I have been ill and the company has been so understanding!!! They take care of my husband, praise his efforts and do what they can to meet all his needs, we are so grateful!! Wonderful company. Everyone that works here really goes above and beyond to help drivers succeed. Great Company! I went through the GYCDLP at Appleton and it was wonderful. Ryan, and Mike Carrey taught me so much in ways that made sense to me. I wouldn’t have been able to back as well as I do if it wasn’t for them. My over the road trainer Jim Brinkman was amazing! From day one in his truck I was in the drivers seat, I was doing everything from the get go. He made me prepared to be on my own, and I’m so thankful for him. Even now if I have a question he is there to help. My training FM Sara made sure I was prepared every step of the way for my own truck. Honestly this company is like a family, and they will have always been there for me. I believe in their values and the safe 7 work. Thus far, Roehl, has been true to safety practices. Company is all lies. Tell you one thing to get you in then change it. They favor flatbed drivers. They Don’t listen to their trainers when they make recommendations. Avoid this place. They are not safe and will have you do unsafe stuff. At in Michigan. Just received my truck after successfully completing phase 2. Could not be any happier with the outcome since day 1 when I contacted you guys. This is a great company to work for if you have a problem they always work with you so that you have a positive outcome. When you work for this company it’s not just a company everyone here is team and it’s more of a family feeling. Great company to start your career. Roehl will teach you how to SAFELY drive a heavy vehicle and you get paid to learn. Best time I had learning in a long time. So I Have been with Roehl for only a couple of weeks now and I have had nothing but a positive experience so far. The training department has far exceeded the training I thought that I was going to be given. Like a few movies, some paper work, this is how e-logs work and send me on my way. It was the complete opposite Arron Rathbone sat down with me and taught me the Roehl way of safety being the number one key part of this company. ALL questions that I had were answered if I had a problem he would try and take it from a different angle so that I could see what was being said. ALL the staff here in phoenix give this OC a home feeling which is nice for a new driver coming into the company and not feel stressed out and overwhelmed. Great friendly staff keep you rolling. Great trainers and training material. Good trainers...all around good people. Roehl is a great place to work , they care about safety and drivers well bieng . The company wants the driver to be successful. I love working for Roehl transport they are always there for me and i have had some rough times at home while i was out on road and they were on top of my needs ! Everyone i have had to deal with at Roehl was great come join us! great company! wish the PTO was better and wish they had FMLA. But overall great place to work! I gave a full 5 star rating because I feel that Roehl does go above and beyond for me as a driver. I go above and beyond for them and it's returned to me. I run my loads safely and have established solid communication with my FM. If you work hard and be safe and do your job then the entire company will do theirs to ensure you are able to do your job. It boils down to this...Roehl isn't your mother they won't baby you or hold your hand. But each employee and driver is your family and every one on this family team has you back and will help you if you are willing to help yourself. To me when choosing a trucking company Roehl is the only option. Sure others may have a big "tricked out" truck but Roehl has the dedication to your success and is fully committed to keeping you safe. I chose to come back to Roehl. I worked here for about a year when a situation at home arose that called for me to be home everyday. Upon leaving Roehl did an amazing job with my resignation and allowed me to return the truck to Atlanta to put me closer to my home in NC that was one of the biggest things that stuck out. My fleet manager seemed genuinely concerned for my wife and expressed his hope for me to return. I came to Roehl the first time with a CDL but no experience. From the first contact with a recruiter I had a good feeling. Through training and my first miles as a driver I felt confident in this company. When I left I felt like I had left a family. Roehl as a company says they are a team but I felt then and still feel that we are a family. When I decided to return to over the road trucking Roehl was my first option. I put in 9 applications and had 7 offers of employment. I still choose Roehl because safety is #1 and even when. I'm not at home I feel like I'm with family still. Just today I had a great conversation with a Roehl driver. Each truck waves at one another. The atmosphere of the terminals is like a family gathering. These things built upon hard work and safety is something that you can't fake. Roehl is a one of kind company, with their determination to provide each driver a safe and comfortable career and their willingness to take criticism and all around legitimately care about the drivers. As truckers we have so many opportunities to go drive another truck somewhere else. Sure some companies have these big "tricked" out trucks...but they don't have the family and the safety and the brotherhood that Roehl does. I take great pride in my red wagon, I wash and polish her and keep her looking new. I take great pride in my ride because I'm proud to be a trucker and I'm proud to truck for Mr Roehl. 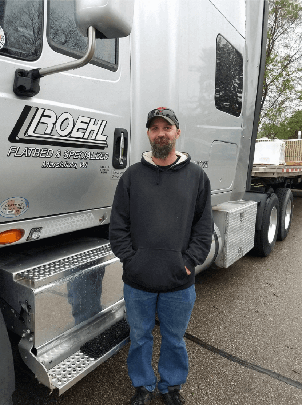 It's one of the things that I love about Roehl, we aren't just truckers driving for some guy in Wisconsin, we are part of a family of truckers and part something larger than ourselves. In most cases a Roehl truck is the first to blink their lights to help another truck pass or get out and help another driver back into a tight spot. This company isn't just a paycheck to me. To me this company is my family. I missed the family when I was gone and since coming back it has only made my belief stronger. Excellent place to work and excellent hometime!! So glad I chose Roehl for my driving career! I started my "retirement" career with Roehl. The reason I left was because my age, I could could not adjust to OTR.Roehl did teach me something I could not replace, I received my flatbed training there. Their flatbedders will know what I mean when I say a Menards load. Well, multiply that by ten when I say what I am hauling now. Without their training, I would be dumping loads all over the place. I still abide by Roehl rules for load checks over FMCSA rules and am thankful for their training. Hauling everything from 1/8 inch rods to 10 inch I beams and 3 inch plates on the same load is a lot easier when I use what Roehl taught me. Thank you Roehl. I have been at Roehl for ten years and it's been an amazing company to work for from the get go. Money's flowing, hometime is great! Brand new to organization, and not once have I felt like I have been a burden with questions. Folks going out of their way to make me feel at home. They worked with me on getting dot problem fixed and kept me in the loop. The GYCDL program was great as well as the instructors really caring about the students overall success. I've only been in phase one of training, I need to see what happens as a company driver to see if a five star is warranted. This company provide me with plenty of information about Roehl. The safety & training they share to stay on top of such a high demand the economy is requesting. Would of gave 5 but gave 4 due to communication could be better. Biggest down fall I seen is there so short on trainers to student ratio. Takes all day to get assingned new truck, tools and a load out. If they could speed all that up everything would be great. Team Roehl really does function as a team. All departments work together for the betterment of the driver, the customer, and the business as a whole. I have never worked for a company that is so focused on its' goals and execution to reach those goals. All of this is to say: Team Roehl is the place to be in the transportation industry. As I prepare to retire from ROEHL this month, I would just like to share some thoughts about ROEHL. I came here looking for a company who would give me a good pay check, and give me safe equipment to run. A company who puts SAFETY 1st, who cares about my safety and of those around me. I am proud to say that I have 1.25 MILLION SAFE driving miles in the short years I have been here. I have been in all lower 48 states and 5 of the Canadian Providences. I have many of good working relationships with those in maintenance and fleet managers. I will miss ROEHL, but I am very glad that they allowed me to drive for the best company there is! I notice how Roehl take care of their employees. They just do not care about the success of one group of people but all. Company has worked with me, utilized my abilities, and shown that they actually care. Started off bumpy. Would have originally given a 1 star rating but decided to wait before blasting them. Been with the company a year now. Did the GYCDL program in May 2017. Went to Trainer Foundations in December 2017. Now I am glad I waited. Miles are over 2300 weekly. Home roughly when I want to be for as long as I have earned. Shown appreciation for everything I have done beyond what Roehl expects. Treated with respect and given the opportunity to both teach and learn while I continue to grow with the company. Ready for the next step in my career as I quickly approach the end of my 15mo/120k mile contract. Biggest change I have seen is a quicker response to maintenance issues. Faster routing to a terminal or shop for diagnostics and repairs and more detailed reports from the mechanics doing the work rather than a quick summary breakdown of what was checked. This is the most professional company I've worked at since leaving my 22 yr career in law enforcement. They really care about safety. They are consistent in their goals and mission. I left once but found my way home. I'm here until I retire. Why I chose roehl. Well a very good life long friend of mine named Jeff who is also an employee of roehl referred me. I’ve never heard anyone speak so highly of a place before. So my wife and I sat down and researched it. The ratings and scores roehl carries were great. I have 20 years driving experience but haven’t really worked for a large company like roehl. It’s like learning all over again. I’ll be 40 this year and have no retirement set up for the future. Once checking into that part also I found that unlike most other companies roehl actually cares about their drivers after retirement. That’s a huge plus in my book. I haven’t found anything bad commented about the company yet. I’ve already come to enjoy my job tho I’ve met several challenges along the way. I’m working on week two and I think once settled in roehl will be my retirement place. The company speak volume on values and quality,from safety to driver and equipment and that say a lot for Roehl transport,and I,m to be abroad as a team member. Overall company is good for my first company. I am new to trucking. Equipment is good quality, resources are available to help and training is pretty good. Biggest issue is disjointed communication between departments. Orientation and Operations had basically no communication, so was not a smooth process to go into on-the-road training. And recruiting did not effectively prepare me for being away from home for over 4 weeks during orientation and over-the-road training. Excellent training and follow-up and communication. The best thing about Roehl is their ethics on Safety. This is the main reason why I selected Roehl. I'm learning pretty fast to be a newbie that knows nothing about the industry. They sure that you become proeficient at every aspect of the trucking industry. Well so far roehl has been great to me. I haven't herd anything bad about roehl. Recruiter gave some bad info, I was not prepared to spend 2 plus weeks away from home or to go into extreme cold weather. These guys and gals treat you like a person. They care about your needs and wants and often try to accommodate you for those. I feel more at home here than I have ever felt with any other company. Great managers, good miles, good hometime, decent pay, diversity is welcomed here. You do your job you get left alone for the most part. I recommend this company to anyone who can get on here. Seriously my life wouldn't be what it is today if it wasn't for this company, thanks for being such a great and caring company Roehl! I really do enjoy driving for Roehl. I've made more than double the money working for them than I did at my last job. They provide me with all the tools I need to succeed and then some. My fleet manager is pretty great and keeps moving to get as many miles as possible. Just wish he would send me out west though. I may have a degree in chemistry and biology and neurology, but I feel more at home behind the wheel of a rig, and I have Roehl to thank for that opportunity. Roehl also allows me to make ample money to support my family while being able to spend plenty of time home with my daughter. I just want to send a big thanks to all of the kind and caring folks at Roehl Transport. Working for Roehl has been an absolute blast and it's the only job I've ever had that I haven't woke up and felt like not going to work. I'm proud to say I work for Roehl Transport because I know I'm treated as a PERSON, not just another number. Everything I could hope to find in a company, Roehl goes above and beyond. And another big thing is I can have my family, albeit small, with me. Both my fiance and my fur baby have enjoyed the road! I've had zero complaints since my time coming on board with Roehl. All of my issues, which have been few and far between, have been addressed and handled in a proper manner, all of the staff at the terminals treat me with a warm smile, my FM is absolutely fantastic, and I feel like I'm part of a large family. That's the best thing about it to me. Roehl takes driver safety seriously. Up to date well maintained equipment. Lots of Positive feed back from current drivers. Safety home time and good pay plan is why I made the switch. The training provided was exactly what was needed to pass the CDL road test, and went on to provide a course on load securement which was essential to this industry. Cause Roehl is about safety, it's nice to know that I am not the only one who cares about it where I work. I like taking precautions and know I won't be questioned about what it is I am doing with safety as the foundation of every action I take. They not only just talk about it, they act on it and speak up when there is a cause for concern, regardless of how it looks or what it might imply. Safety is king at Roehl and I appreciate that. I wanted to find a better job. My old company was not treating me very well and that’s putting it nicely. And you guys have a pet policy – I really want to get some type of pet to take along with me. Roehl seems more involved with their drivers too. You want me to know that you’re here to help. That’s a difference that I haven’t seen at any other companies I’ve driven for. Because i been hearing good stuff about this company and all the training i think its very good. All safety training is something i was looking to find in a company and i found it at roehl. This is probably the only company or one of very few that offer paid training. This supports their claims that they care about their drivers’ safety and well-being. They’re upfront and blunt about anything and everything. They won’t sugarcoat anything which in turn helps you grow as a driver instead of lulling you into a false sense of security. They won’t allow you to drive in severe inclimate weather and even offer you pay to try and persuade you not to drive and they even have a policy in place to keep their drivers safe by removing them from the roadways on New Year’s Eve. It certainly seems like safety truly is a cornerstone of this company and that they practice very well what they preach. There was a lot of help given and information provided for me to succeed. I feel I joined the right company as far as pay and opportunities that I am given. The entire hiring and training process from start till now has been excellent. Very professional company and group of people to work with. Kesha, my recruiter, was great. My trainers - Tom, Dan, and Mark were excellent. I am in training at this point. Besides the Army I have never had this kind of training in my life. I like it and it is working for me. Outstanding training and constant communication with the drivers. An excellent company to work for if you are looking to enter the transportation industry or looking for a career change. Safety and employees are held as the highest values. I would like to express exactly what my experience is with Roehl Transportation. I previously worked for a very small family owned trucking company and decided I wanted to go bigger and better. I started looking into different companies doing flatbed and to be honest, I was scared and unsure of leaving the comfort of a small company to move into a big company. However, when I called Roehl Transportation and spoke with DeeAnn Lamberth, I knew this is where I needed to be. DeeAnn was kind, courteous and did everything in her power to help me become part of the Roehl Team. Being 6.5 hours from Gary, Indiana, I was given the option of flying or driving. I chose to drive. Roehl got the rental car for me from National Car Rental, the car was a 2017 and was a very nice ride. I also spoke with Megan A., who was in charge of doing all background checks. Megan was just as much of a pleasure to speak with as DeeAnn. In addition to speaking with these two great women, I had the pleasure of meeting some wonderful people while attending my orientation in Gary, Indiana. The instructors were very helpful and knowledgeable. The hotel we stayed at in Gary, Indiana was very clean and staff is very courteous. Upon starting orientation at the terminal Monday morning, everything was all set up for us. The physical, drug screen and road test were done. The trucks used for road test were newer automatic Freightliner Cascadia's and automatic International ProStars. Also available is 10 speed transmission. After completing Day 1 and moving forward, van drivers received 3 days of orientation, while flatbed drivers got 5 days orientation. Just in all, I sincerely want to thank everyone in Roehl Transport for making me feel a part of the team. Roehl is big on safety of others and our selves, that's big. Amanda is being really helpful and interested in why I joined Roehl. I have enjoyed roehl so far. Everyone I have come in contact with from Roehl has gone out of their way to ensure I am informed, understand expectations, and welcomed to the Roehl family. The more I learn about Roehl, the more satisfied I am with my decision to join Roehl. The training is the best.If you have any question they will give you the right answers..I never had a problem with Roehl they never did say anything that was not true they don't sucker you in. the vans are old and rusty, please lubricate fifth wheel hand latch, landing gear, tantum release bar, back door latches and wings near to be repair. The only reason I didn't give it 5 stars was because so much didn't pertain to the dry van. Temps and air circulation come to mind. But the odors and cleanliness of the trailers did. Seal integrity comes to mind. When I first decided to pursue a driving career, I contacted because they were doing a lot of advertising for drivers in this area. They made me an offer but some of what the recruiter was saying just didn't sound right to me so I declined the offer. Prior to going with Roehl, I was delivering campers from Goshen, IN to dealerships throughout the northern Midwest and I saw a lot of Roehl trucks. They were all clean and appeared to be new and well maintained so I started to research Roehl on line. Our website (guess I can say that now :) ) is very good and I learned a lot about Roehl there. The attitude on safety and driver welfare impressed me, so I applied. I was contacted quickly by recruiting and developed a great relationship with Dakota. He was excellent! He answered my questions & concerns directly and honestly. If he didn't know the answer, he said so and got back to me when he found out. Everything he told me then has turned out to be true and accurate. I also have to say after my first 4 weeks with Roehl, I feel very confident I made the right decision. The trainers were excellent! The impression I got from the website has been proven true by my experiences so far. This has probably been much longer than you wanted and I apologize for that but that's my story. :) Thank you for your interest and support Amanda!! It means a great deal to me knowing I have you for support and assistance!! Happy Monday & Take Care, Dale S.
Since I've been with the company I've received nothing but the best training, which makes me we to continue working for the company and build a career. Everything I've experienced since joining Roehl has been exactly what I was told it would be like, if not better. Everyone at this company that I've met has been very nice, helpful, and informative. Thus far, while only being able to complete my CDL training portion with Roehl, it has become very evident that Roehl Transport is a great company to be a part of. From the focus on safety to the professionalism of the staff and on to hanfling of communications, it has been a pleasure to witness. It's an excellent program! I was referred to Roehl by my brother. He was telling me about other companies he's worked for and out of the few he talked about Roehl and it piqued my interest. Four weeks is a time crunch but I came through knowing nothing about a truck to now being behind the wheel. I'm very satisfied with my success through the program. Can't wait to hit the road! Condsidering the short amount of time we are given to complete the program, I find it very well planned out. The instructors seem to have an intuitive grasp of how much guidance each student needs and who needs more and from which instructor(s). I went through the Get Your CDL program recently. I learned a lot during that time. The Roehl training staff did a wonderful job. I am looking forward to the next phase of training. Great company to work with and great people to work with! If you want a company that keeps you safe and keeps you productive you can't go wrong starting here. I'm there out of Conley, GA terminal. Mike is my FM and he's awesome. So is Gabriella and Robert Shreve!!!! Love those folks. I was trained on the road by Jimmy Webb and he's awesome. My CDL instructors were Eugene Harrell and David Ney. They were great too!!! I'm still happy here at Roehl. I feel welcomed and very well taken care of by the company, the administrative and recruiting personnel, and my Fleet Managers Team. I have heard nothing but good things about Roehl an that it's a good place to work. Roehl is a good company. Yes, it could use some tweaking. But, we all could use a little of that! Great foundations are the stepping stone to growth. That sums up Roehl rather well!!! I look forward to a great future with this company. Training was awesome. Covered all aspects for our testing plus some Roehl policies to help us stay out of trouble. The training and the people are amazing!!! Exceeded my expectations. Don and Deandre were the best!!! I would definitely recommend that what you tell people you follow through with when it comes to recruitment. I was told i had to provide transportation to gary, In and i would pick up my trainer from gary,in. That wasnt true i had to provide transportation back. If this is something o would have known about i woikd have waited due to money constraints. Then i had to use my rent money to purchase a plane ticket home. This isnt right!!! Amazing staff over at Appleton. Fox valley instructors were all helpful. And most of all, had the best experience I could ask for. If there was one thing I could change, it would be to experiment with their skid-pad. So far everything I have experienced with Roehl has been positive. I feel that the training I received at Appleton was very good. Looking forward to continuing my training and my career. My experience with Roehl was excellent and excited I have learned alot from all of the instructors and I want to appreciate them for taking their time to teach me about the trucking industry. I like the way they treat people...Roehl is good company...they have good opportunity...and I like the way treat driver's. Roehl takes care of you. Roehl rented me a car to drive down for phase 1,and provided me with food and lodging. Every person I have dealt with at Roehl has been very professional and a joy to talk to. I choose Roehl because they focus on safety, genuinely care for their employees, and give their employees respect. I have enjoyed working and talking to every person I have met at Roehl and am ready to work with you all. I attended GYCDL training in Appleton, WI in February. The instructors are amazing and patient. In less than 6 months I am a dedicated driver for one of our large accounts and the paychecks just keep getting better. I am glad I chose Roehl because of the people. Everyone is friendly and helpful. It made the transition to trucking quite painless for me! I came to Roehl almost 4 yrs ago. Little under 2 yrs I became a trainer. I just want to do my part to make Roehl a safe and fun place to work. They've treated my family and myself well. Why look elsewhere? I just finished the get your CDL program. It is top notch with excellent instructors. Every expectation was revealed up front and nothing was withheld. I felt as though I was completely informed of everything. I would recommend this program to anyone. I am currently out with my trainer in week 3. He is top notch as well. I can't wait to test out and get my truck. Roehl Transport is a great company to work for especially for new and student drivers. Roehl has a training program that has to be one of the best in the industry and if you wish to join Roehl Transport there are lots of options to choose from and various home time options. Roehl Transport has an excellent support structure and fleet managers and maintenance support staff are friendly and attentive. There is always someone around to help you, Roehl Transport believes in Driver Success Not Driver Failiure. In addition Roehl Transport has excellent terminal facilities and terminals are always clean and comfortable. I had a fantastic 4 years with Roehl Transport, unfortunately I had to leave due to the health needs of my family, However I can say hand on heart that when I joined Roehl Transport I knew very little about the industry and after 4 years with the support and training I was given I developed into a safe, confidant driver, I became a driver trainer and was able to give back to Roehl some of the knowledge that had been passed down to me and I am pleased to say that I was able to produce some great driver's, one of which is also now a driver trainer. Roehl taught me there way of driving and doing the job the right way. Paid me to learn and put me in a good truck. When I came back they put me in a new Freightliner with the Auto shift. They have very good equipment and great maintenance. I picked a regional run close to home with pretty regular stops. I was able to get home when I needed to be and the different work schedules are great. I made good money and was paid quick and on time with no problems. In the end I chose not to drive over the road but I had a good experience with Roehl. I've always felt my freight managers and support team at Roehl care about me, my life and family. There is absolutely no chance that I would work for any other company. There will always be people chasing rainbow trucking companies who promise a pot of gold and more money, what a joke. I'll stay with the sure thing, good insurance buy in, steady upward pay scale and folks that care about me having a good job, that's the Roehl difference. There is no other company that stands above Roehl. Roehl truly values drivers and all the people we, drivers, share the roadways with. I can't express enough how amazing the training I had in Marshfield was. All of the different instructors I had while in the school where amazing and very helpful. If you had a question the would answer it or try their hardest to find an answer for you. Everything they teach you really prepares you for the open road. From day one you feel you are part of the Roehl family. On a scale of 1-5 I would say I had a 5 for training probably the best training you can get. I will highly recommend roehl's gycdl program to anyone who is looking to get in to the business. The decision to work for Roehl has been one of the best decisions of my life. I feel very fortunate to work for a company that is built on values. Roehl is a great place to work. Get Your CDL Training Program & Truck Driver Job Review by Vern S.
"I can't express enough how amazing the training I had in Marshfield was. All of the different instructors I had... (were) amazing and very helpful. roehl's gycdl program to anyone who is looking to get in to the business." Here's a small sample of the feedback we've received thus far. We're sharing the words from our drivers so you know that Roehl is for real. “When I first got my CDL, I talked to one of the recruiters (Driver Employment Specialist) but I didn’t join Roehl as a student. I don’t remember why I didn’t join you at that time but I never forgot about Roehl. One of the reasons I came to Roehl is to become an O/O (Owner Operator Trucking Jobs & Lease Program). There are just a lot of home time options at Roehl too."